A new report summarising many U.S. studies on the economic benefits of cycling highlight the large positive impact of cycling on state and local economy. A new report by the League of American Bicyclists and the Alliance for Biking & Walking highlights the impact the bicycle industry and bicycle tourism can have on state and local economies. 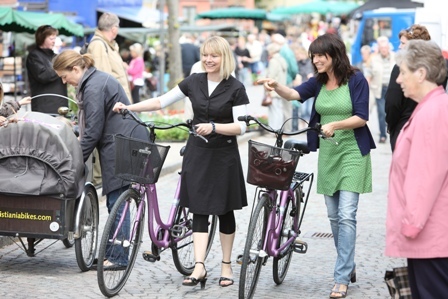 It discusses the cost effectiveness of investments and points out the benefits of cycling facilities for business districts and neighbourhoods. It also identifies the cost savings associated with a mode shift from car to bicycle. The evidence demonstrates that investments in bicycling infrastructure make good economic sense as a cost-effective way to enhance shopping districts and communities, generate tourism and support business. Today the national bicycling industry contributes an estimated $133 billion a year to the U.S. economy. It supports nearly 1.1 million jobs and generates $17.7 billion in federal, state, and local taxes. Another $46.9 billion is spent on meals, transportation, lodging, gifts and entertainment during bike trips and tours. Author of the report Darren Flusche says the most important pieces of evidence for the economic impact of bicycling come from business district studies. Research on Portland, Oregon, meanwhile, shows that bicyclists spent more over a month than either motorists or walkers. Flusche concedes that many of the leading-edge bike projects are in liberal bastions where you might expect an emphasis on biking. There are the usual suspects, but if you keep looking down the list, there is an increasing number of places in the American South and West that are getting in on the fun as well.